For a simple dinner the other night, we had sausages, an Italian pepper stew called Peperonata, and a green salad. A local grocery store has a wonderful in-house meat counter that makes many delicious sausages by hand, many of which are GAPS-compliant. Since beginning the diet, my kids, ages 5 and 7, have begun to really enjoy sausages so they make an easy meal. 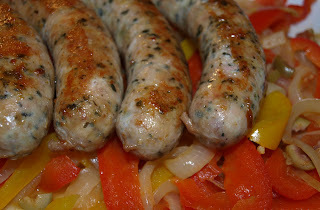 These ones are chicken sausages with basil so I felt inspired to find an Italian side dish to accompany them. Cut the bell peppers into strips, chop the tomatoes, and set aside in a bowl. Slice the onions into thin strips, and saute in the butter or ghee until soft but not browned, then add in the tomatoes and peppers. Sprinkle with salt and cook on medium heat until the peppers are soft but not mushy. Stir in the vinegar and olives, and cook just a little longer. Some recipes suggest adding chopped parsley as a garnish.